An angelic figure pours liquid from one cup to another, usually with more water and a natural scene in the background. 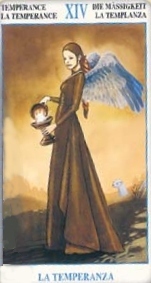 Meaning: The card means that you need to even out something in your life, to remove the extremes. Balance and moderation are key.